How to become a client of the Internet – shop Swissgolden? To become a client of the Internet – shop, it is necessary to register and make an Order. In the Internet shop an invoice will be issued for you and the purchase price will be fixed for 24 hours. It is required for you to pay for the ordered bars within 24 hours and send a copy of your payment by e-mail or to attach to a message on our web site. If payment confirmation is not received within 24 hours, Buyer’s order will be cancelled. 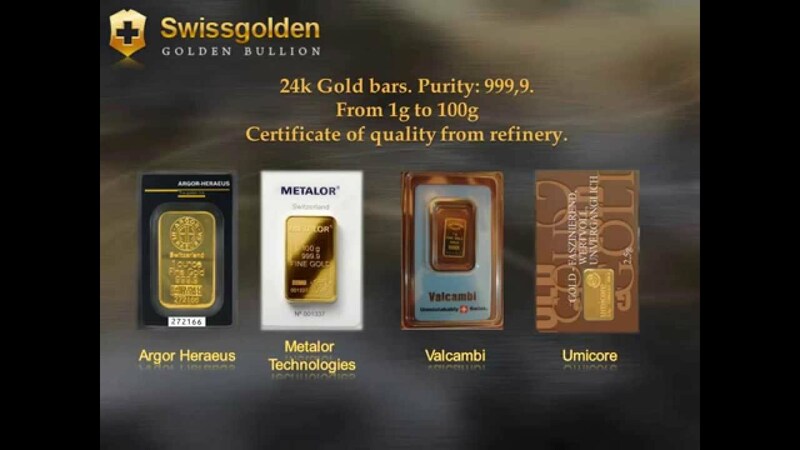 The Company specializes on the sale of investment Swiss and German Gold bars from 1 to 100 grams, as they are the most popular and affordable gold bars for the most of the population. At single purchases, you can make an Order for any amount. The Company charges fee at the rate of 10% for processing and maintenance of Buyer’s order over the whole period, which is deducted at the end of order execution; the Company pays most of the charged fee as Leadership Program reward. It is a marketing program, specially developed to increase sales volume, make advertising and attract clients. Buyer’s order is placed in a table of orders and upon arrival of new order based on the moves ahead to bonus compensation. Participation in the program gives you the opportunity to pay for your Order in increments, both at your own expense and by Credit bonuses, charged to client’s order and intended for investment gold purchase against order execution. It is required to make an order for investment gold purchase in the amount of 7000,00 € for the Main Table of orders, 27500,00 for the V.I.P. table of orders or 98 000 € for V.I.P. Plus table of orders ; and pay for gold bars purchase coupon order. You can place up to three orders on your account at the same time. For example: in the Main table (or Preliminary), VIP (or preliminary VIP) and in the VIP Plus table of orders. What is a Coupon – order? Coupon – order – is a means of payment within the system. Coupon-order for the Main fifteen celled table of orders includes gold bars under 100 gram for the amount of 500,00 € at current prices of the Internet Shop, support service and Internet service fee – 10.00 € per cycle. Coupon-order for the Main seven celled table of orders includes gold bars under 100 gram for the amount of 700,00 € at current prices of the Internet Shop, support service and Internet service fee of 20.00 € per 3 cycles. Coupon-order for the V.I.P. table of orders includes gold bars under 100 grams on the amount of 2750,in accordance with current prices of the Internet-shop, support service and Internet service fee of 50.00 € per 3 cycles. Coupon costs: 65,00 € + 10,00 € = 75,00 € and 500,00 € + 20,00 € = 520,00 €, 700,00 € + 20,00 € = 720,00€, 1000,00€ + 50,00€ = 1050,00€, 2750,00 € + 50,00 € = 2800,00€ and 9800,00 € + 50,00 € = 9850,00€. Coupon-order with a payment of 75,00 € is placed on the Preliminary fifteen-celled table of orders, Coupon-order with a payment of 220,00 € is placed on the Preliminary seven-celled table of orders, Coupon-order with a payment of 520,00 € is placed on the Main fifteen-celled table of orders, Coupon-order with a payment of 720,00 € is placed on the Main seven-celled table of orders, Coupon-order with a payment of 1050,00 € is placed on the Preliminary VIP table of orders, Coupon-order with a payment of 2800,00 € is placed on the VIP table of orders, Coupon-order with a payment of 9850,00 € is placed on the VIP PLUS table of orders. Most of expenses paid by a lot of Companies are advertisement expenses. Our Company has analyzed and combined the most progressive marketing strategies of direct sales in the Internet and has developed innovative marketing program called Golden. Due to this program Company advances a part of fees for buyers’ orders processing on financing of the advertising – marketing program and upon execution of Buyer’s Order deducts Order processing service fees. For the full order execution Buyer’s order should pass two cycles for the fifteen-celled Main table of orders or three cycles for the Main seven-celled, V.I.P. or V.I.P Plus table of orders. After the first cycle of the main table of orders is completed, the Company gives the opportunity to transfer Buyer’s Order to the second cycle upon termination of which, the Order is considered executed. After the first cycle of the Main seven-celled, V.I.P. or V.I.P Plus table of orders is completed, the Company gives the opportunity to transfer Buyer’s Order to the second cycle and after the second cycle of the table of orders is completed the Company gives the opportunity to transfer Buyer’s Order to the third cycle upon termination of which, the Order is considered executed. If Buyer’s Order has not received required number of credit bonuses at the end of two cycles for the main fifteen-celled table and at the end of three cycles for the Main seven-celled, V.I.P. or V.I.P Plus table of orders, the Buyer has the right to carry out obligations at the end of the Order at the expense of own means. If the Buyer does not execute the Order, the Order is automatically extended for another two cycles for the main fifteen-celled table of orders and for another three cycles for the Main seven-celled, V.I.P. and V.I.P Plus table of orders at the expense of the Buyer’s bonuses. And it proceeds this way until full Order execution. When the full amount of the Buyer’s Order has arrived to Company’s account and all financial documents were settled, and with the participation in the marketing program bonus compensation is to be credited on customer’s order at a rate not less than the amount of the Order 7000,00 € for the Principle table of orders, 27500,00€ for V.I.P table of orders, or 98 000 € for V.I.P. Plus table of orders. Yes, you can, any time. It is required that the current owner sends us a request of changing owner attaching a scan copy of his (current owner’s) identification document (it can be passport, ID or driving license). In order to start this procedure you should enter the menu Profile – Start the Procedure of changing owner. As the re-registration of the Order on new Owner, involves considerable additional costs, the Company charges a re-registration fee in the amount of amount of 20,00 €. The Company has developed marketing program, as an additional opportunity to fulfill Buyer’s Order and everything depends on the effort made by the owner of the order to promote its order to the bonus compensation. Buyer should involve minimum two new orders to his order. Only in this case Buyer’s Order moves to the compensation. Two new orders involved on the first or second level of the first cycle of the main table or two orders, involved on any level of the V.I.P. table of orders are considered for all following cycles. Many buyers can meet their obligations by the means of the marketing program, but owner of the order should always be ready to fulfill his order at his own expense. All incoming customers’ orders are placed on the first level of the Table of orders and upon placement of new Orders they move from level to level in order to get reward. Buyer’s order should pass four levels of the Table of orders for the Preliminary and Principle fifteen-celled table of orders and three levels for the Principle and Preliminary seven-celled, VIP and VIP Plus table of orders. This is a cycle. For the Principle and Preliminary tables of orders, the cycle is considered finished after the order placed on the fourth level goes to the compensation and the bonus compensation is charged to the Buyer’s order on which the gold bars are bought. For the Principle seven-celled, VIP and VIP Plus table of orders, the cycle is considered finished, after the order placed on the third level goes to the compensation and the bonus compensation is charged to the Buyer’s order on which the gold bars are bought. Especially for participants of our marketing program we provide intermediary services in issue of debit cards. Card will be linked to your account; it will be easier to withdraw funds from your Euro account as well as you will be able to use it in ATMs and POS terminals that use the Mastercard app. How to create Multiaccount if you already have several registered accounts? If you already participate in more than one marketing program, you can choose your Main account and unite orders from other accounts with it. Mandatory condition to create a multiaccount is that all united orders should be registered under the same sponsor’s account, and orders should be placed in different types of tables. For example: in the Main program, VIP Program and V.I.P. PLUS program.